If you need a little help getting through hump day, Mucho Vegas Casino might have the answer. Every Wednesday, members can claim a 50 per cent match up to $100 just by making a deposit of $25 or more. So if you add $100 to your account, for instance, you get another $50 bonus cash on the house. – Player can receive only match bonus per week in the context of this promotion. The bonus is available from Midnight on Tuesday Central European Time to Midnight on Thursday Central European time. 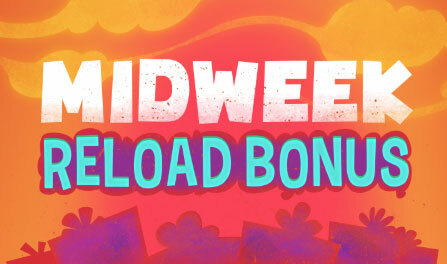 – To receive the Midweek Reload bonus, please select the bonus when making your deposit. The match bonus will not be credited to players who did not select the bonus during the deposit. The minimum deposit to qualify for the offer is €/$25 (250 SEK/NOK/ZAR). Find out more at MuchoVegas.com, where new punters can claim up to $1500 bonus cash and 150 free pokies spins.